Through a variety of education, networking and advancement programs, ONLA strengthens and builds the integrity of our industry while helping businesses like yours succeed. The OCNT program encourages continuing education, improves the public profile of the industry, and increases an individual’s hiring potential. ONLA partners with the National Association of Landscape Professionals to offer this national written and hands- on testing program in Ohio. 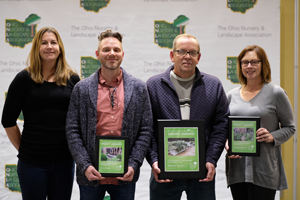 ONLA’s annual awards program celebrates the expertise and artistry of landscape professionals who have executed outstanding residential and commercial projects. ONLA has a long-lasting tradition of honoring individuals who have made significant contributions to the field. ONLA supports legislation that meets the needs of Ohio’s green industry. This one-day event connects legislators with industry professionals. Advocacy Day is your opportunity to tell your story, learn about current issues, and have an impact on legislation that will affect your businesses. ONLA awards scholarships each year to college students as well as high school FFA students. This annual competition tests students’ skills through hands-on events designed by industry professionals. OHLO broadens the high school education experience and introduces students to the many opportunities offered by a career in the green industry.